Let’s be honest here, the initial Bridge Constructor Portal announcement kind of hit the Internet like a wet fart. Combining a beloved license with a not so beloved indie game about building bridges wasn’t exactly what fans were hoping for when rumors of a new Portal game announcement started swirling in 2017. 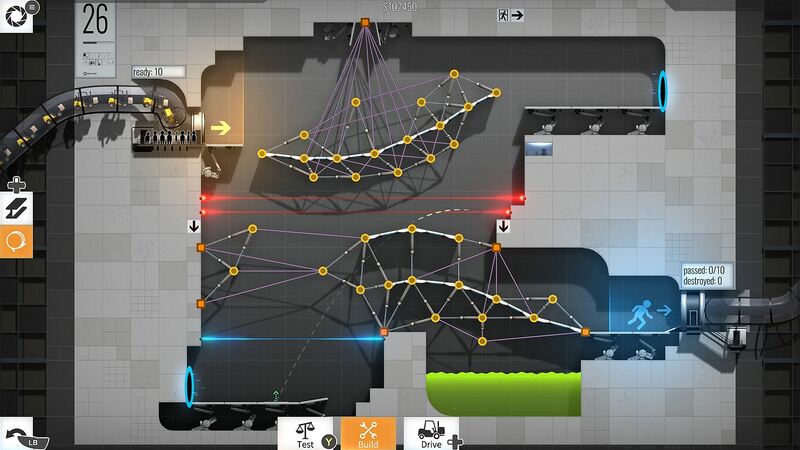 Now that the game is out on consoles, however, how does Bridge Constructor Portal actually play? Far better than anyone could have predicted, I’m happy to say. 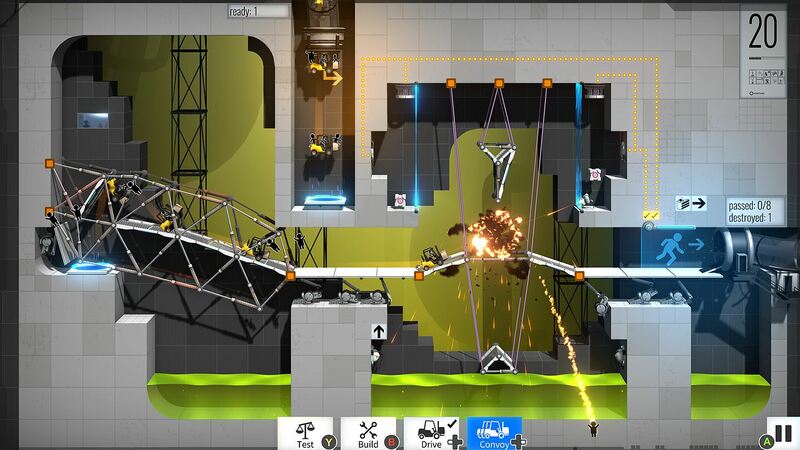 It combines the humor and twisted science of Portal with Bridge Constructor’s physics-based gameplay pretty much perfectly to create what is easily the best Bridge Constructor game yet. And it’s the third best Portal, so way to go! Continue reading for all of the details on Bridge Constructor Portal for Xbox One and PS4. It can’t be understated just how well Bridge Constructor Portal nails the Portal theme. They got it perfect. You play as a new employee at Aperture Science where your job is to test bridge building in conjunction with Aperture’s other technology like portals, propulsion gel, aerial faith plates, companion cubes, emancipation grills, sentry turrets, and much more. The aesthetic of gleaming test chambers and glowing portals is absolutely spot on and Ellen McLain even reprises her role as GLADOS in another solid performance. The sense of humor is perfect and the tests are twisted and wonderful. This may not have been the Portal game fans really wanted, but there is no doubt that this is a real Portal experience and not just some lazily thrown together cash in like some folks feared. The gameplay starts out like a typical Bridge Constructor game with you building bridges on a 2D plane so vehicles can cross gaps. It is a little simpler here, however, as there are only two types of materials this time around – metal girders and suspension wires – and you have infinite resources to build whatever you want, though there are still pre-set mounting points you have to use. The twist, of course, comes when Aperture Science’s crazy technology is introduced. The portals – of which there can be several differently colored pairs on each map – are already placed on the map, so you can’t just put them wherever you want, and it is up to you to build bridges and take advantage of other technology to ensure vehicles get safely from point A to point B. There are sixty levels in Bridge Constructor Portal that gradually ramp up in difficulty, The latter half of the game has you criss-crossing jumping paths and building precisely angled ramps and thinking about building and maintaining momentum and all sorts of stuff just like we did in Portal 2. They did an incredibly good job making this feel like a Portal game, but still maintaining Bridge Constructor’s distinct style of puzzle solving. It would have been nice to have more freedom to place the portals at will, of course, but that would have almost certainly made things too easy so I can understand why they didn’t do that. The game is pretty accessible as you can “beat” any level by just passing one car through a level, so you can see the whole game pretty easily, but the real challenge comes from running a whole convoy of vehicles through at once and hoping your bridges hold up and the trucks don’t all collide in midair. You can iterate and test instantly and infinitely, too, so you can quickly come up with new ideas and build them and test them as much as you need to. I honestly got bored pretty quickly in previous Bridge Constructor games, but the puzzles are really good this time around and the crazy tech from the Portal games makes things interesting enough to keep me coming back. Bridge Constructor Portal has great presentation overall that is consistent with the Portal series. Clinical looking menus. Clean test chambers. Glowing portals. It’s all here. The sound is perfect and the music is great as well. I played the game on both PS4 and Xbox One and the performance was fine on both. Bridge Constructor Portal isn’t Portal 3, but it’s pretty darn good on its own and fans of both Portal and Bridge Constructor will find a lot to like here. It’s got the solid core gameplay of Bridge Constructor paired with the sense of humor and puzzles of Portal in what turns out to be a surprisingly perfect match. 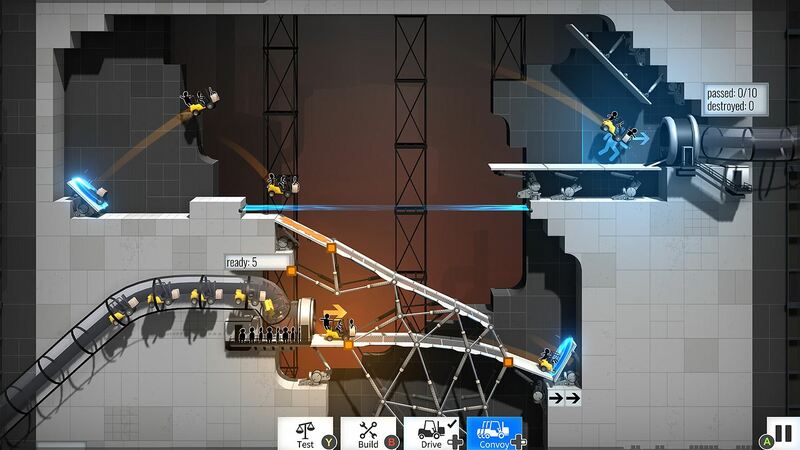 Bridge Constructor Portal is a well put together mash up that showcases the best of both franchises. Buy it. Disclosure: Review codes were provided by the publisher.